RICHMOND, VA - The Richmond Flying Squirrels will partner with Victory Golf Events to hold their first charity golf tournament, the Flying Squirrels Charity Golf Open on Monday, June 17th at the Dominion Club. All proceeds from the event will benefit the Miracle League of Richmond. The tournament will be played with teams of four competing in a scramble format along with a celebrity teammate. Celebrity teammates will include Flying Squirrels players, coaches and staff members as well additional celebrities from the sports and media community in Richmond. "Hosting a golf tournament is something we have wanted to do since we arrived in Richmond," said Flying Squirrels' Vice President & COO Todd "Parney" Parnell. "We always have a lot of guys on the team who love to play, and it is a great way to get many of our other friends in the community involved to aid the effort of the outstanding folks at the Miracle League of Richmond. I just hope I don't hack it up too badly out there for the Dominion Club's sake." The field will be limited to 25 teams, and those interested in participating are encouraged to register as quickly as possible to ensure availability. To register a team, please CLICK HERE! 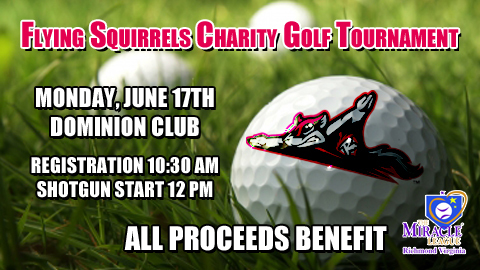 To sign up a team for the Flying Squirrels Charity Golf Open CLICK HERE!